My second post this year is about..... SNACK!! Hahaha... I can't deny that I really like snacking. I like chocolate (duh! ), I like peanuts (well, this kinda new, because while I'm in my vacation at Bali at the beginning of this year, I'm snacking peanuts), and I like everything as a snack. 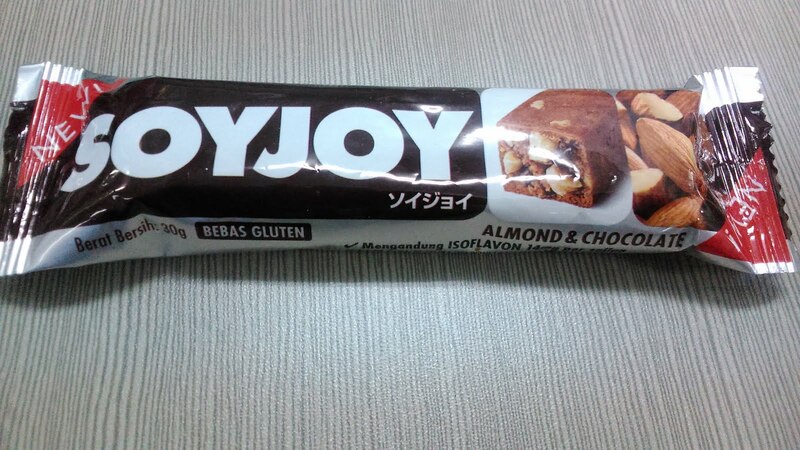 I want to introduce new soyjoy flavor, call Almond & Chocolate. There's a lot of flavor of this soyjoy. Because I live in Indonesia, so I just mention some flavors in Indonesia, like banana, peanut, hawthorn berry, strawberry, and raisin almond (you can find all the flavors here). I believe, in Japan it self you can find more flavor than these. 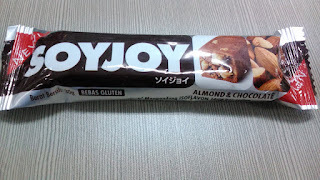 Yes, because of soyjoy are snack from Japan. For me, my favorite flavor from soyjoy is strawberry and hawthorn berry. So I bought one, and I keep it for 3 days at my bag, because I forget I have that, and just remember this afternoon, when accidentaly I'm looking for something inside my bag. 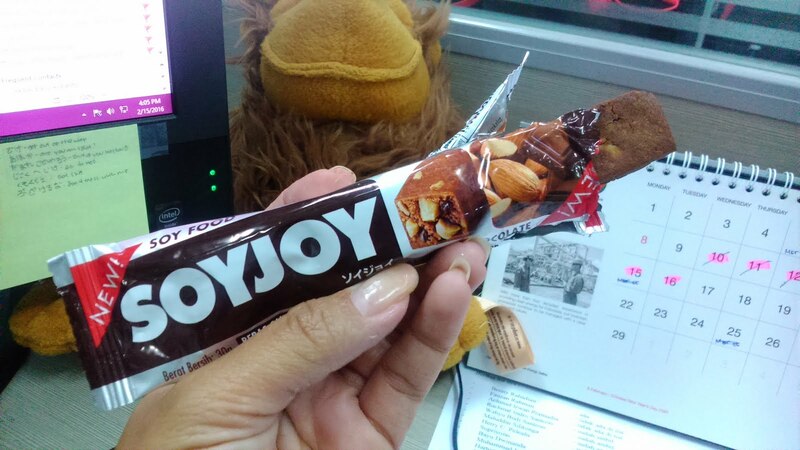 Because of it have chocolate taste, so it wrap have a brown color, to show that that's another variant of soyjoy. and you can see chocolate and almond picture there. If you ever taste soyjoy before, so you know there will be no sweet as candy flavor in this snack. Same like this new flavor. But, you can feel the almond there, and a bit chocolate taste. If you hoping that it will taste like chocolate bar, maybe you have to think again. Because soyjoy is a healthy snack, so you mostly can taste the soy taste. And, maybe because I keep it too long at my bag, the almond is not as crunchy as almond nuts. Once again, maybe because I keep it too long at my bag. Don't worry about the bar, it looks like chocolate bar, so I guess it will makes you want to eat it immediately. For those who have taste tempeh, the texture maybe looks like the soft tempeh, not too crunchy. Once you bite it, there will be no small crumbs will affect to your working desk. for chocolate and peanuts snack lover, this snack can be another alternative. When you feel really fat, but want to snacking. Because it's logo as healthy snack, so you don't have to worry to feel guilty.